Snoflyer Advertisers Please Support Them! 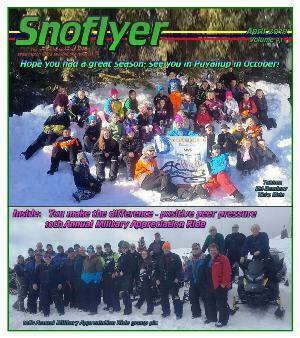 APRIL SNOFLYER (APR '19) - Click here for the April issue of the Snoflyer. Looking for the page-flipper version? Click here. WSSA AWARD WINNERS ANNOUNCED! (Mar '19) - WSSA congratulates the following annual award winners. Thank you all for your commitment to snowmobiling and snowmobilers in Washington. 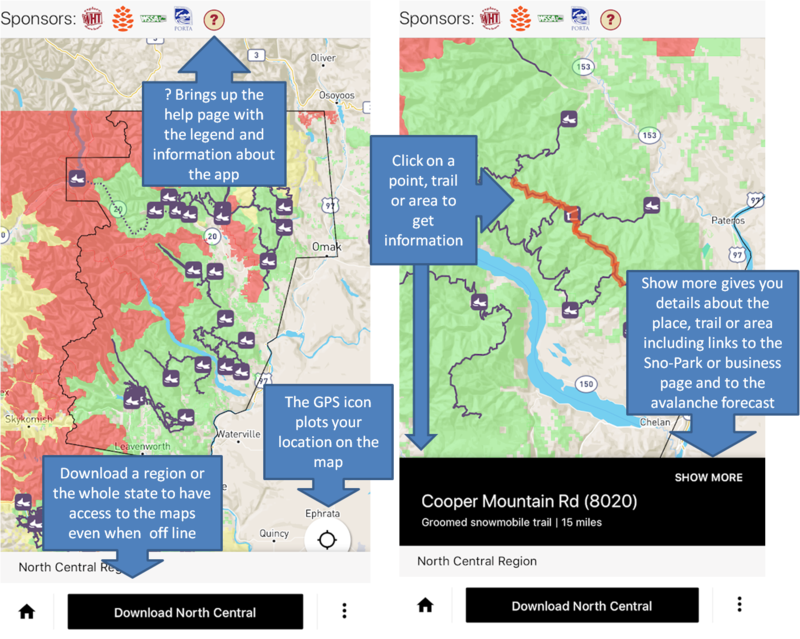 WASHINGTON SNOWMOBILE TRAIL MAP APP NOW AVAILABLE FOR ANDROID & IPHONE! (Jan '19) -Snowmobile WA offers enthusiasts the information they need to hit the trail. Heading to an area without cell service, you can download data for a region so you can use the maps off-line. The app shows trails, trail heads, places to ride, and select businesses that cater to snowmobilers. Trails include groomed routes that make up the Washington Sno-Park system, other roads popular with snowmobile clubs, and connected trails in Priest Lake Idaho and the Tollgate area of the Umatilla National Forest in Oregon. Click on a trailhead to learn what pass is required along with information about facilities and parking. The public lands background tells you where you can ride off trail, where you have stay on designated trails, and where snowmobiles are not allowed so you can have fun and stay legal. Each trail and trailhead also links to the appropriate avalanche forecast so you can check conditions before you head out. Click here for helpful app use info. UPCOMING ON-THE-SNOW CLUB EVENTS (Jan '19) - All events snow permitting and be sure to contact the club/association sponsoring the events for updated, detailed information as changes may occur. away! E-mail snoflyer@wssa.us for details. NOTICE OF FINAL DETERMINATION FOR TEANAWAY COMMUNITY FOREST RECREATION PLAN (Nov '18) - Click here to view the Notice of Final Determination for Teanaway Community Forest Recreation Plan. Among other things, the document contains comments submitted and the DNR's responses to them. IS YOUR SNOWMOBILE CLUB THRIVING? (Dec '17) - At the November WSSA Leadership Meeting, Jon Ferrian, WSSA's Safety Chair/NWAC Board member/member of multiple clubs, presented a PowerPoint presentation on building and maintaining a thriving club. Check it out and see if there are ideas in it for you. (Do you have something to add?If so, let us know!) Click here for the presentation. OSV DESIGNATIONS ON NATIONAL FORESTS (Dec '17) - It's coming! The Forest Service has been directed to complete travel plans for over-snow vehicles (OSV). This process will require diligence on the part of snowmobilers to ensure we don't lose any important trails or riding areas. While it hasn't started in ernest here in WA, it has in CA. Check out this letter sent to the Lassen National Forest by the BlueRibbon Coalition. Issues pertaining to the Pacific Crest Trail are relevant here. Read the letter here. NATURE CONSERVANCY LAND MANAGEMENT PLAN RELEASED (Dec '15) - Of interest to snowmobilers is an article from the Ellensburg Daily Record regarding the Management Plan for the Nature Conservancy lands purchased last year. It's good news for snowmobilers and other motorized recreationists. (Remember though this is privately-owned land and our good stewardship must continue!) Check it out here. WSSA MEMBERSHIP BRINGS DISCOUNT FOR LIFE FLIGHT NETWORK (Nov '16) - UPDATED! Northwest MedStar is now Life Flight Network. Seconds count when a critically ill or injured patient needs specialized medical attention, and so does the medical team caring for you. From bases all over the Northwest, Life Flight Network safely transports thousands of patients each year in Washington, Oregon, Idaho, Western Montana, Northern Nevada and Northern California. Life Flight Network, a non-profit organization, is the region's premier critical care transport service dedicated to the safe, compassionate care for thousands of critically ill or injured patients each year through helicopter, fixed wing and ground-based transports to health care facilities throughout the Pacific Northwest. The price is $45 a year, or $225 for five; a bargain if you ever need this emergency service. Click here for the WSSA/Life Flight Network membership application. Visit www.lifeflight.org for the details of this life-saving insurance. LOOKING FOR SNOWMOBILE SAFETY AND ACCESS INFORMATION? (Jun '14) - The Snowmobile Safety and Access Information Center is provided by the American Council of Snowmobile Associations in fulfillment of a cooperative agreement with the U.S. Federal Highway Administration (FHWA) to support snowmobile safety and access training and product development. Your one stop shop; click here to visit www.snowmobileinfo.org! WSSA IS ON FACEBOOK, INSTAGRAM & TWITTER (Jan '10) - Search "Washington State Snowmobile Association" on Facebook and become a fan! We are "wssa.us" on Instagram. Check us on Twiter too at "wssaus".